Northern cardinals are medium-sized songbirds (8-9 in). The adult male is bright red with a black face and red bill. The adult female is buff-brown with a red tinge to the crest, wings and tail. Like the male, the face is black and the bill orange. Backyard bird enthusiasts almost always want to attract the bright red Northern Cardinal. To landscape for cardinals plant evergreens, berry bushes, and fruit trees as part of the habitat. Cardinals nest from 4 to 8 feet off the ground in evergreens and dense shrubs and use fruit trees to provide food and shelter. The cardinal has expanded its range greatly since the days of John James Audubon. Originally a southern bird, the Northern Cardinal began expanding its range into northern states around the 1900’s. During the early days of this expansion they would migrate back south during the winter. But in time they became a year round resident in Michigan and winter is a great time to watch cardinals. Cardinals will eat beetles, cicadas, grasshoppers, and snails, but prefer wild fruit and berries, sunflower seeds, safflower, and nuts. They will feed on the ground or perch at hopper feeders, platform or tray feeders, and some tube feeders. 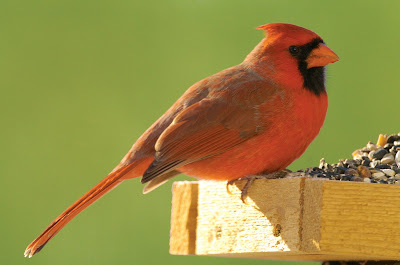 Cardinals are often the first to visit a feeder in the morning and the last to stop by and grab a bite at night. In winter cardinals generally flock together but by spring they pair up for nesting season. They are famous for their display of courtship feeding. The male picks up a bit of food and takes it over and places it on the female’s bill. Also as spring approaches you may hear the male sing several different songs to attract a mate and establish and defend his territory.